With the onset of Summer, many residents around the lake host barbecues and parties especially around the 4th of July. host, promote or support the use of fireworks of any kind around our lake. Both the Bellingham and Blackstone Police and Fire Departments have advised us about their concerns regarding the use of fireworks and parking issues during the summer season. Please take into consideration the issue of parking. The streets are narrow and if it is determined that Emergency vehicles CANNOT access any residence due to vehicles blocking the roadways, the police and fire department will have such vehicles towed in order for emergency vehicles to be able to gain access. 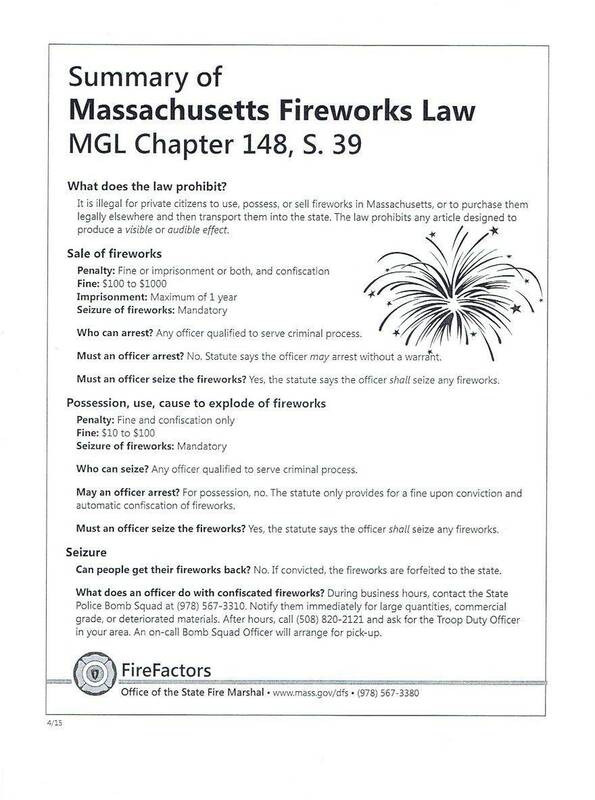 Also, Please be aware of the laws regarding fireworks. These guidelines will be strictly enforced in both Blackstone and Bellingham.